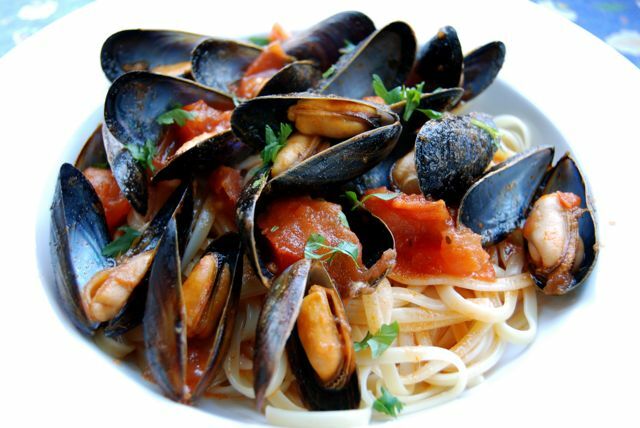 Mussels are one of my favorite foods and this delicious recipe couldn’t be simpler. Serve over pasta for a satisfying meal. Courtesy of Prevention’s The Healthy Cook. Warm the oil in a large saute pan over medium heat. Add the onions and saute 8-10 minutes, until soft. Add the garlic and saute 1 minute. Stir in the tomatoes, lemon juice, water (and wine, if using), bay leaves and thyme. Cover and simmer, stirring occasionally, 35-40 minutes, until the mixture is thick and chunky. If you prefer a thinner sauce, simply mash some of the tomatoes with the back of a spoon. Stir in the parsley and basil. Add the mussels and cook 3-5 minutes, or until the shells open. Discard the bay leaves and any unopened mussels. Season to taste with black pepper. Remove from heat and serve immediately.